The truth is that there is content GOLD just sitting there inside their head and in every interaction they have with their target market. If you are struggling to create content consistently because you don’t know what to write about, try one of these three methods. Picture one REAL person you’ve served, whether they are a past client, a future client, or someone you worked with for free. This person should fit into your target market. Then, put yourself into an imaginary conversation with them. The topic of the conversation is around what their problem is, where they need to be, and how you can take them there. What are the problems they bring up? What questions do they ask? What desires are they expressing? What wisdom did you share with them? What did you do with them to resolve their issue or get them closer to what they desire? After you’re done with that imaginary conversation and your notes, think about another REAL person in your target market. Do the same exercise. Do this exercise for several of your contacts and clients who are the type of people you want to work with. I say it this way because you may have worked with people in the past who you wouldn’t want to work with again. We want to attract the people you DO want to work with. What are some topics that show up multiple times? 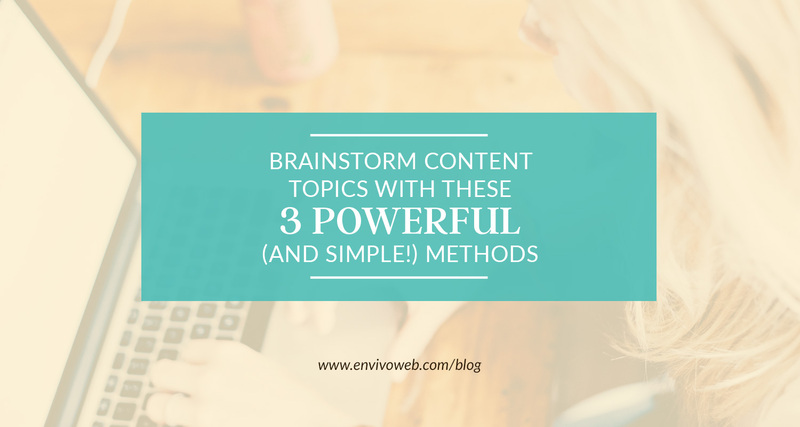 Those are topics you should create content around. To get them from where they are right now to where they want to be, there are some things they need to know, right? So the question is: what do they need to know in order to get to where they want to be? Example: One of my clients is a career counselor. One of the things she does is help recent college graduates find employment in their desired field. What are some things that recent grads need to know in order to find a job they enjoy? They need to know how to approach the unique challenges that come with transitioning from “student” to “working adult”. There you go. There are 4 blog posts. Consider the first idea: discovering what their workstyle is. This career counselor can write a blog post that describes 4 common workstyles. There is a LOT to know about different workstyles that it would be nearly impossible to go fully in depth about them in a single blog post. But she can give an overview to give them a good idea of where they fit. In order for them to identify what their style is and how to proceed, they need to have a conversation with her and potentially work with her. That’s how she can give value and also generate leads. What does your ideal client need to know in order to solve their problem? Whenever someone asks you a question, write it down! The third strategy is my favorite and arguably the easiest. People are ALWAYS giving you content ideas in the form of questions! What you need to do is always go into conversations with ideal clients with your ears open. Note what questions they are asking you. Create a document where you can dump all of these questions. You can do this in Google Drive, Evernote, Trello, or a good ol’ fashioned notebook. If they ask a question (that’s related to your work, of course), make a mental note of what it is. Later, record it in your document. Then next time you need to sit down and write a blog post or create a video, you literally have a list of things you can talk about! To help you with brainstorming content ideas, I have created a PDF with 100+ blog title templates that will help get your creative juices flowing. Creating content isn’t enough. You need to get them to actually click and read. So as an added bonus, these blog titles are designed to pique your ideal client’s interest and get them to consume your content. Do this little exercise with me right now: what is the one question you’re asked all the time? Tell me in the comments below!